The remains of what is believed to be a medieval priory have been unearthed following a Time Team-style dig by Northumberland villagers. The 12-strong team at Holystone in Upper Coquetdale had just five days to carry out the excavations next to the village’s St Mary’s Church. It was the latest in several attempts by villagers over recent years to find the priory, which was established in the 12th Century and lasted until it was targeted in Henry VIII’s dissolution of the monasteries in 1539. But this time the villagers had help from Deepscan AR Ltd from Alnwick, a research and development company specialising in ground penetrating radar systems. The scan findings guided the diggers to the most promising location. The priory, run by nuns, was near Lady’s Well, a natural spring flowing into a stone tank of possible Roman origin and which is a now a scheduled monument cared for by the National Trust. 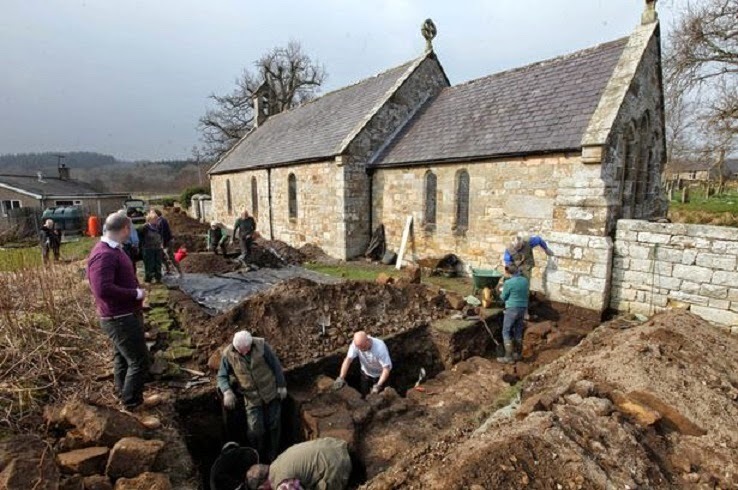 Members of the Holystone History & Archaeology Group were given permission by the church, and the landowner and tenants, for the five-day dig, which was funded by Northumberland National Park Authority and Coquetdale Community Archaeology Group. The operation, led by villagers Jan Frazer and Richard Carlton from Newcastle-based The Archaeological Practice, quickly uncovered significant medieval remains. These included a wall with foundations 7ft wide which is thought to have been part of the priory church or the cloisters.